Waterloo – The KW (Kitchener-Waterloo) Library of Things is ready to start lending almost everything but a physical hand. Co-founded by Wilfrid Laurier University graduate student Devon Fernandes, the not-for-profit initiative will function like a regular library, except that instead of books, members will be able to borrow infrequently used items such as tools, camping equipment and kitchen items. Located within the midtown Kitchener office of Extend-A-Family Waterloo Region, the library will be officially launched Saturday, Feb. 24 at 9 a.m. with speeches from Fernandes; Manuel Riemer, Laurier associate professor of psychology and co-founder of the Sustainable Societies Consulting Group (SSCG); and Allan Mills, executive director of Extend-A-Family Waterloo Region. Extend-A-Family and SSCG are partners in the project. The initiative aims to create positive community change in multiple ways. One is environmental sustainability. Producing underused tools and equipment for every household consumes a lot of resources – raw materials, energy, labour and money. Having people share these items is more efficient, particularly when people might have otherwise put them in landfills instead of donating them to the library. Another aim relates to providing meaningful work and living wages for people with disabilities. In fact, as far as the team knows, it will be the first library of things in the world to provide living wages to people who face barriers to meaningful employment. The library will try to eliminate those barriers in ways such as building part-time work schedules around people’s needs rather than the other way around. “The unemployment rate for people with disabilities is twice that of the rest of the population, which speaks to the fact that we really need inclusive employment opportunities that work for individuals and embrace the gifts they have to offer,” said Fernandes. Yet another aim relates to building community, both by putting people in touch with each other and by making it easier for everyone, including the less well off, to access tools and equipment they need only occasionally. 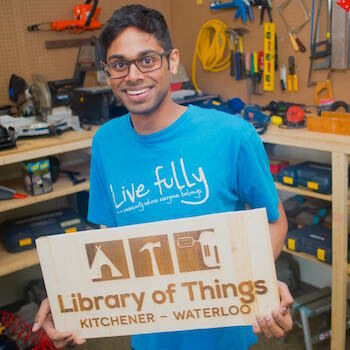 The idea for a KW Library of Things originated with Laurier alumnus and adjunct professor Felix Munger (PhD ’14), co-founder and principal consultant of SSCG. In 2016, he encountered a library of things in Berlin while doing some research in Germany. He thought it would be great to bring the idea to Kitchener-Waterloo, but progress was slow until Fernandes, a master’s student in community psychology, came on board in September 2016 as part of a community practicum course. A donation party in November attracted some 350 items, ranging from tile saws to bread makers, which are listed at kwlot.ca. The Library of Things continues to accept select donations of needed items. Contact kwlibraryofthings@gmail.com before donating. Becoming a KW Library of Things member costs $40 a year and enables access to all items on the library for a week at a time on a first-come, first-served basis. Membership subsidies are available to those with limited incomes. The Library of Things is located at 91 Moore Ave., Kitchener. The KW Library of Things is supported by a variety of community and campus organizations, including Laurier's Graduate Enhancement Fund and the Kitchener and Waterloo Community Foundation.